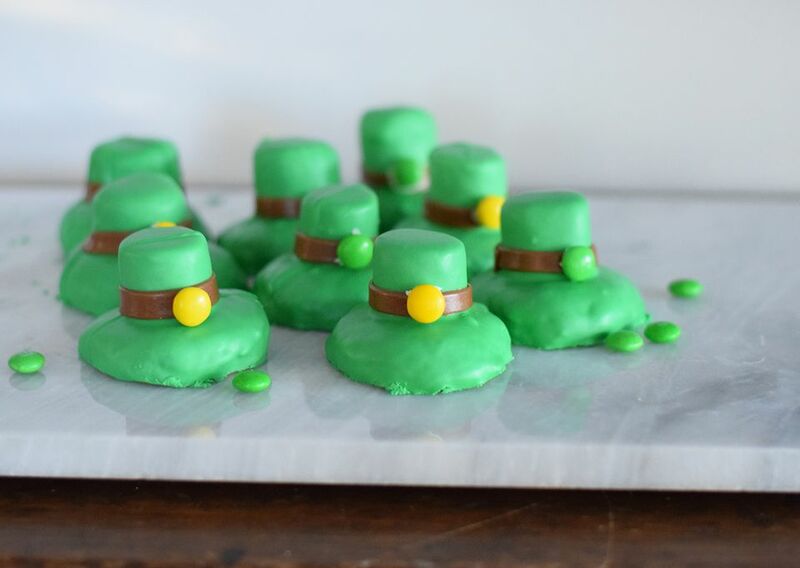 Spread the luck of the Irish to everyone you know with these wonderful St. Patrick's Day cookies. Perfect for a school celebration or a St. Patrick's Day party! They are a lot more manageable to make than they appear, and can be made from scratch or using some store-bought ingredients! You can easily use refrigerated, store-bought sugar cookie dough and store-bought frosting or you can use the recipes below. Add the softened butter, sugar, orange peel, and vanilla extract to the bowl of a stand mixer. You can also use a regular, medium-sized bowl and a hand mixer. Blend until the ingredients are creamed together. Add the milk to the mixture and blend again. Scrape down the sides of the bowl as needed. Sift together the dry ingredients and gradually add them to the creamed mixture. Mix until the dough has formed. Using a medium-sized cookie scoop (holds about 1/5 tablespoons), scoop the cookies and form them into balls. Place them on a parchment lined baking sheet. Dip the bottom of a drinking glass in flour and press down on each cookie to flatten them into round disks. You can also roll out the cookie dough into a sheet (pre-chill the dough for an hour) and use a 3-inch round cookie cutter to cut out the shapes. The second strategy will produce a flatter brim for the base of the cookie. Bake the cookies for 8 to 10 minutes or until set and very slightly browned at the edges. As soon as you take them out of the oven place a marshmallow on top of each cookie. The heat from the cookie will help the marshmallow stick to the cookie. Transfer the cookies to a cooling rack with a cookie tray underneath and allow them to cool completely, 1 to 2 hours. Melt the vanilla frosting in the microwave, heating for 30 second increments until smooth. Whisk in the green food coloring until it is the desired tone of green. While the cookies are still on the cooling racks over the cookie sheets, pour the frosting over each cookie so that it is completely coated in frosting. Allow them to completely harden, about 6 hours. Roll out each tootsie roll into a thin sheet. Use a pizza cutter (or a sharp knife) to cut the tootsie roll sheets into 1/4 inch strips. Wrap each tootsie roll strip around the base of the marshmallow where it meets the sugar cookie. Apply a dab of frosting onto the back of an M&M candy, covering up the "m" logo. Stick it onto the tootsie roll strip. Repeat with the remaining cookies. Serve the cookies on a cute St. Patrick's Platter or alongside some edible, gold coins.